Trying to eat healthier and buy local? You’ll want to try the tasty recipes below. Tell us in the comments section what your favorite local foods and recipes are! Be sure to read our feature story, Is It Healthier to Eat Local? Pour sugar into a mortar of sufficient size. Add the donne’ sali and garlic cloves into the sugar. Lightly pound the sugar, garlic and pepper with the pestle until they form a rough paste. In a bowl, combine the sliced string beans, shredded mango, sliced cherry tomatoes, and the sugar, garlic, and donne’ paste together. Add the juice of half a lime and the fish sauce. Mix the ingredients well so the sugar crystals dissolve. Taste and adjust to your liking. The key is to balance the sweet element with the salty element (sugar and fish sauce), as well as retaining the perfect blend of hot and sour elements (donne’ and lime juice). Plate up and garnish as you like, then serve immediately. This is a local twist to a classic SE Asian dish, showcasing Guam’s seasonally ubiquitous green mangoes. To make the Tamales Gollai dough, beat the room temperature lard or shortening until fluffy. Beat in salt, sugar, donne’ sali, black pepper, cumin, masa harina, and baking powder until the mixture is crumbly. Add the chopped moringa leaves, chopped bacon, green onions, and red bell peppers and mix well. Add the beef stock gradually into the mix very slowly while continuously beating. Spread 1~2 tbsp of tamale mix in the middle of a pliable banana leaf. Fold both the left and right sides over the middle section, totally enclosing the tamale mixture. Fold both the top and bottom ends over the middle section to seal the tamale. Wrap each folded tamale in aluminum foil to seal it tightly and prevent any leakage. Arrange the completed and foil-wrapped Tamales Gollai into a steamer. Fill the bottom of the steamer with hot water, then cover the steamer. Cook the Tamales Gollai for approximately 40 to 60 minutes, taking care to top up the water in the bottom of the steamer. When done, remove from them from the heat source, then remove foil wrap from each one as you plate them up. Garnish with a side of local calamansi and serve while warm. For a more health conscious version of this recipe, lard substitutes, salt substitutes, low-sodium stock, and low fat turkey bacon are great choices! To make this tropical island milkshake, place the soursop puree in a blender. Add the milk, sugar, splash of lime juice, and yogurt, then blend well. Adjust sugar to taste and more lime juice if needed (keep in mind the ice cubes you are about to add will dilute the sweetness somewhat, so adjust accordingly). Add ice cubes, blend mixture until ice is crushed. Pour into a tall glass, garnish as you like, then serve immediately. Hint: Make a simple sugar syrup in place of undissolved sugar. It will bypass the time spent mixing and trying to dissolve sugar crystals in the blender. 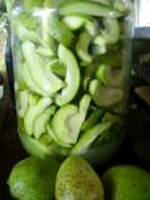 Fresh, ripe, strained guava puree can be substituted for soursop in this recipe. Simply delicious! *Soursop seeds are toxic, so be careful when processing this fruit at home. Please be sure to remove each and every single seed. DIRECTIONS: Mix together in blender. DIRECTIONS: Slice cucumbers and overripe avocados. Season with vinegar, salt, and black pepper. 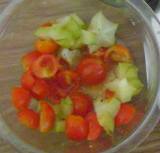 DIRECTIONS: Sliced tomatoes with star-apple seasoned with salt, black pepper, and vinegar. DIRECTIONS: Bought at Bemyore Market (Barrigada). Already precooked. Steam for a couple of minutes, peel off the skin, mash it, add salt and a little water (optional coconut milk), shape into balls, and steam them in banana leaves. DIRECTIONS: Boil taro leaves and stalk with coconut milk, yellow ginger, and lemon, and pork (optional). Cook over the fire as it takes a while. Yield: 6 Prep Time: 10 min. Total Time: 10 min. Combine the chopped basil, canola oil, olive oil, lemon juice, mustard, honey, garlic, sea salt and freshly cracked pepper, to taste in a shallow dish. Blend the mixture with an immersion blender until well combined. Drizzle over your favorite salad ingredients and toss to coat evenly. Serve immediately. Enjoy. 1. Peel and cut sweet potato, tapioca, banana, and taro roots in 1″ cubes. Rinse and drain using a colander. 2. Using a large pot, (non-stick) arrange your cubes in the pot; add water to cover the cubes. Cover pot, let it cook for about 30 minutes, or until roots are soft. 3. Reduce your heat to medium-low. Sprinkle the salt and sugar; add the tapioca pearls and coconut milk. Cover pot, let it come to a boil for 10 minutes (until thickened). Remove from heat. Saute pan with coconut oil. Mince garlic and place into pan with local spinach until leaves turn tender. Remove from pan and place in a bowl. Oil pan again and lightly grill avocado slices. Remove from pan and place into bowl with spinach. garnish with fresh coconut flakes. 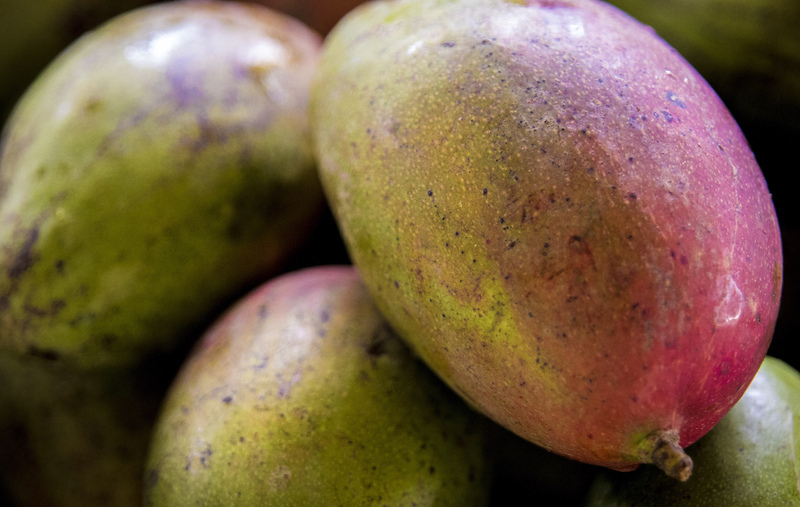 Place sliced mangoes in a jar. Add vinegar and salt until mangoes are fully submerged.